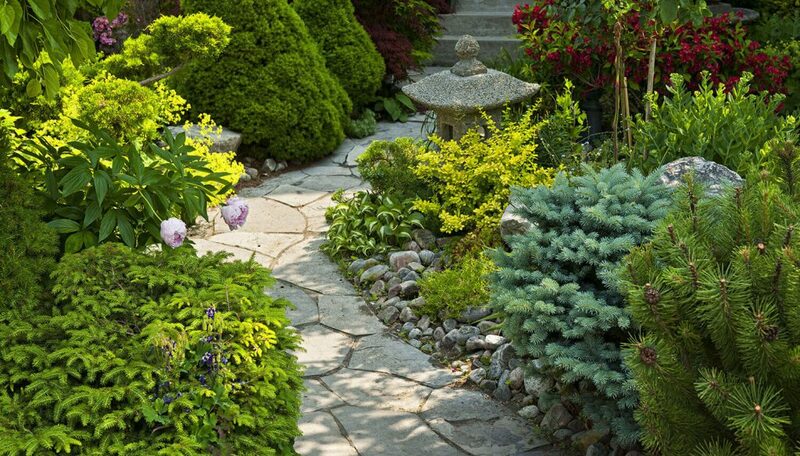 Are you thinking about redoing your driveway, patio or front entryway and not sure if you want to go with natural flagstone or flagstone pavers? If so, then read on and learn which hardscape solution is best for you! Flagstone is a sedimentary rock, which simply means that it is composed of many different layers. The most common colors of this natural stone include buff (a yellow-brown), red, and blue/gray. There are other colors available, but the latter are the most prominent. Natural flagstone also comes in irregular shapes, but can be cut and trimmed to fit your stylistic needs. A few of the different types of natural flagstone materials are sandstone, limestone, quartzite, and bluestone. These flagstone types are quarried from different areas, which influence their color and shades. Since it is a layered natural rock, the stone should remain protected from natural elements to inhibit “peeling,” or any other deterioration of the surface-layers. For instance, UV rays from the sun, standing water from a sprinkler system, morning dew, as well as other natural elements which will all expedite the deterioration of the stone. 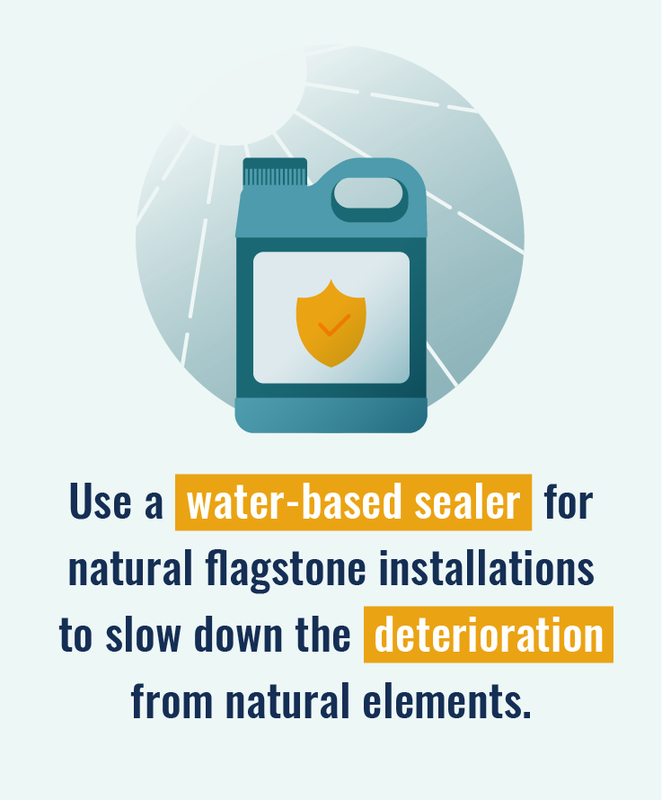 A great solution to protect flagstone from natural elements is to install a sealer after the installation. The recommended sealer is a water-based natural sealer, which allows your stone to breath, while slowing down the effects of the natural elements. If you do not opt to seal your project, your stone will eventually start to break-down as the layers deteriorate. You might have seen a flagstone installation where it appeared like there were divots or holes scattered throughout the installation, which is in fact the sedimentary layers of the stone flaking away. How Does SeLongaler Last and How Often Does Sealer Have to Be Reapplied? It all depends on several factors, such as the amount of sun the stones are receiving on a daily basis, the amount of use (foot-traffic, vehicles, etc. ), or the amount of precipitation that the stone receives. In addition to these factors, there are also several different sealer applications which can be used, and they have different life expectancies. However, on average you are most likely looking at a sealer reapplication range of every two to four years. This is just an average range and could be less or more, depending on your specific situation. Since flagstone is a natural product, you are limited by the colors that are quarried. There are going to be price variations based on the quarry location and color. The more rare and/or exotic the color, the more you are going to be paying for the material. Depending on which color you select, there may be lead time, in terms of when the product will be available for delivery. 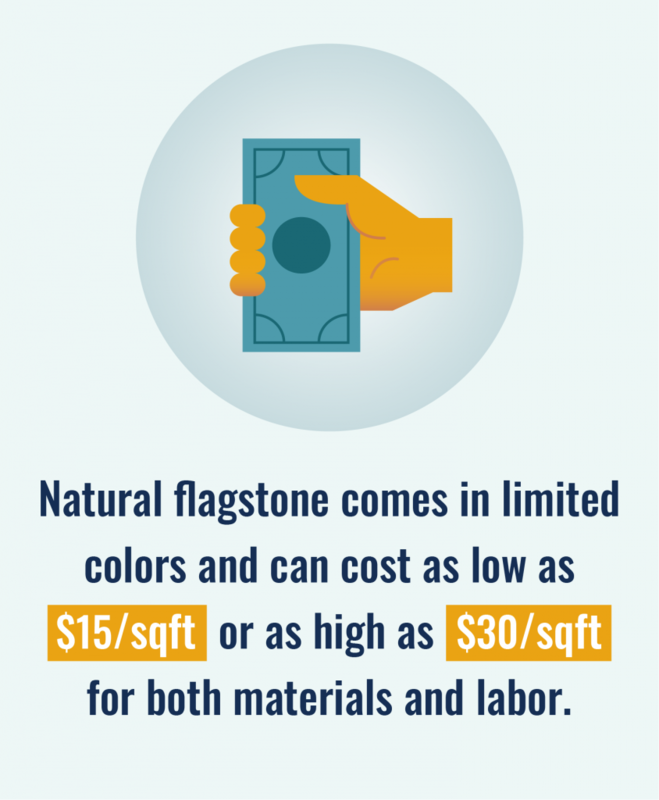 Flagstone is pricey, especially if you are buying quality material and installing it the correct way. If you are going the flagstone route, then it really doesn’t make sense to do it any other way than with top notch materials and utilizing an experienced installation crew. You can think of it like buying a Ferrari and skimping on the engine with a Honda engine under the hood. Looks nice on the outside, but when you expect it to perform as you hit the gas, you are going to be very disappointed. When installing natural flagstone, make sure you do it right from the start. It all begins with ensuring that you purchase top quality materials, and select an experienced crew that installs flagstone for a living; not a side-gig. The price for material and the installation of flagstone is going to be all over the map. Typically, it will run anywhere from $15 per square foot to $20 per square foot, all depending on the material you choose, and the experience of the crew. We have even seen prices as high as $30 per square foot. 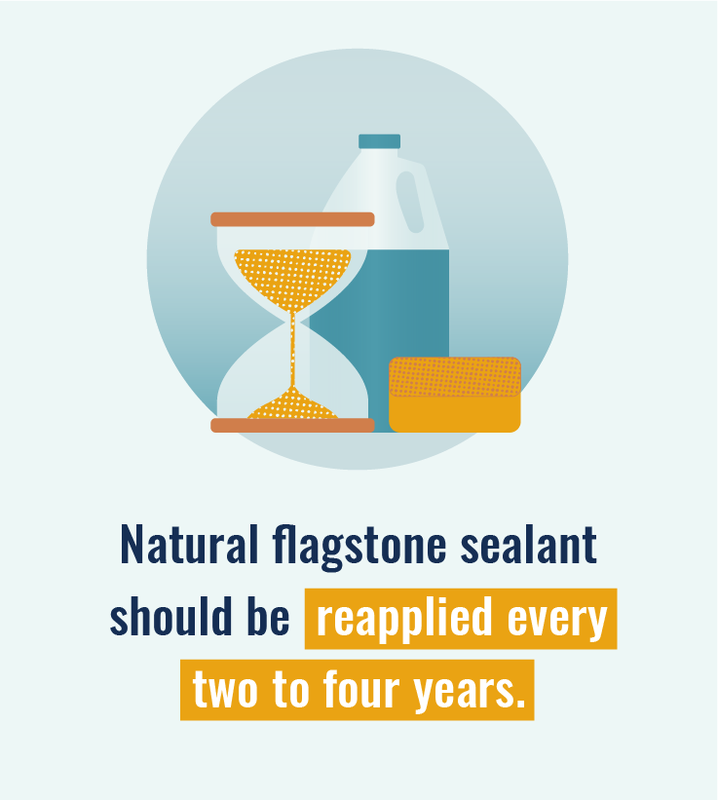 Natural flagstone sealant should be reapplied every two to four years. The better the material and the more experienced the crew, the more you are going to pay in material and labor costs. Makes sense right? The old adage, “you get what you pay for,” generally holds true more often than not! If you are going to go this route, please make sure you do your homework first. The more time you spend up front with an effective due diligence strategy, the less potential headache down the road. 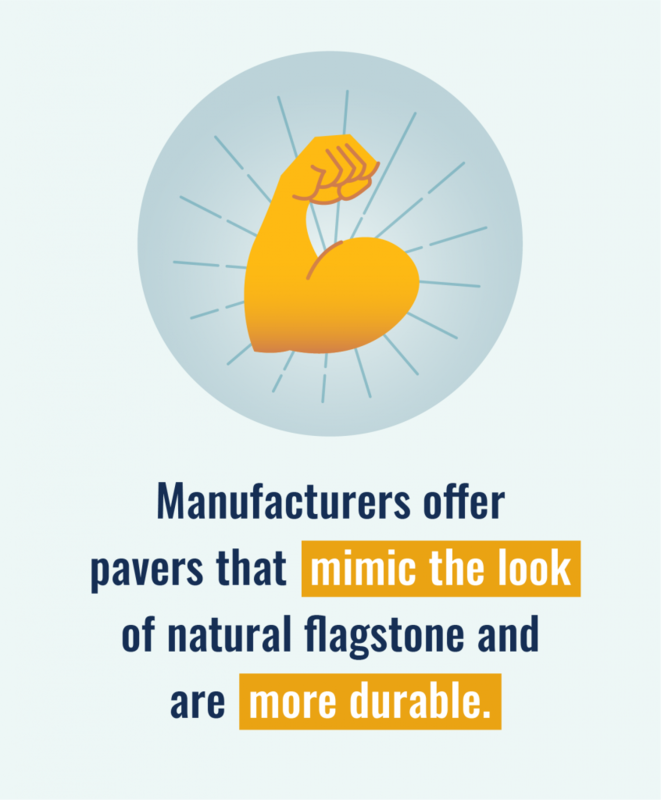 The main difference right out of the gate is that pavers are a manufactured product as opposed to a natural stone. This means all the variables that go into producing paving stones are controlled within a facility. Having controlled variables as opposed to unknowns is considered a good thing, so the durability of the product can be ensured. If you are interested in a complete break down of the cost of pavers, check out our pavers cost guide . The guide will let you know what to expect in regards to flagstone pavers cost. Pavers come in a vast variety of shapes, styles, colors, and textures. 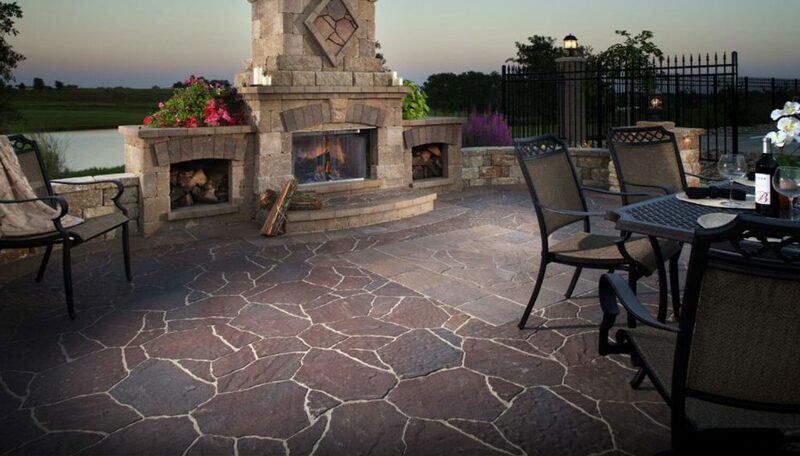 Since we are comparing pavers to natural flagstone, the great thing to note is that Belgard manufactures pavers, the Mega-Arbel and the Mega-Libre , which are intended to replicate the look of natural flagstone. The Mega-Arbel and Mega-Libre flagstone paver lines are relatively new products on the market right now, and are extremely popular. Other paver manufacturers that have flagstone pavers are ORCO and Angelus. 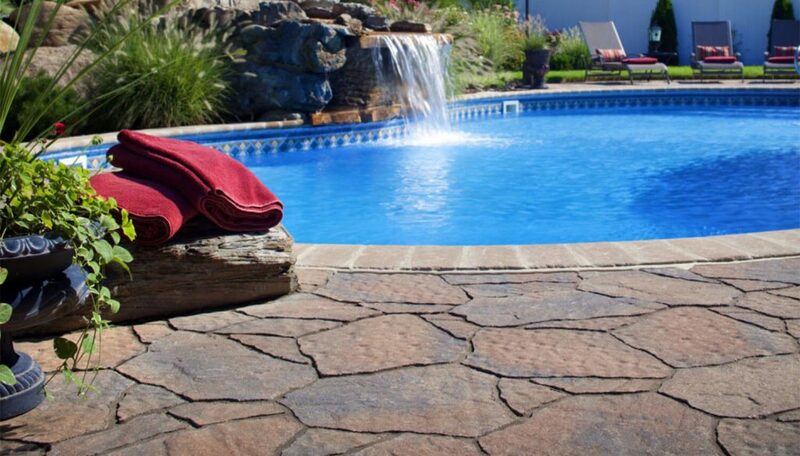 ORCO’s Corsia pavers and Angelus’ Slaton pavers are beautiful replications of natural flagstone, similar to Belgard’s. Many customers who are interested in flagstone and discover flagstone pavers are impressed by the similar qualities, and are sold almost immediately. 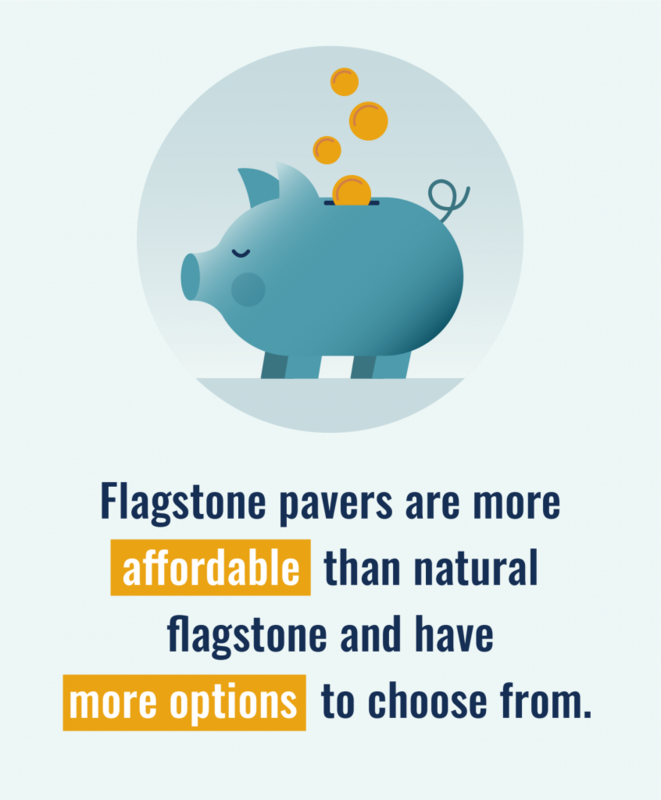 The cost all depends on which natural flagstone you choose. Assuming you were going to select a quality flagstone installer and a quality stone, then flagstone pavers will be half the price. Not only are pavers enticing in terms of their price point, there are more colors to choose from, you have more design options, and most importantly they are backed by a LIFETIME PRODUCT GUARANTEE against breaking and cracking. 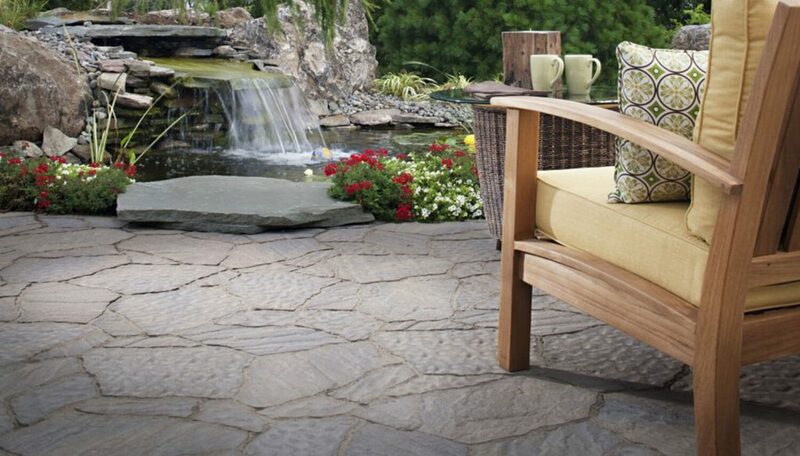 Remember how natural flagstone is composed of sedimentary rock (a.k.a. layers)? Well, since pavers are made in a controlled environment, they do not have these layers and as a result you do not have to worry about the stone breaking down over time. Since the paving stones are backed with a guarantee, you can have piece of mind that your new flagstone paver patio, driveway, or entryway will be the last one you will ever have to install. If you love the look of natural flagstone, price is not a concern, and you understand the maintenance factor to upkeep your new install, then natural flagstone is the way to go. 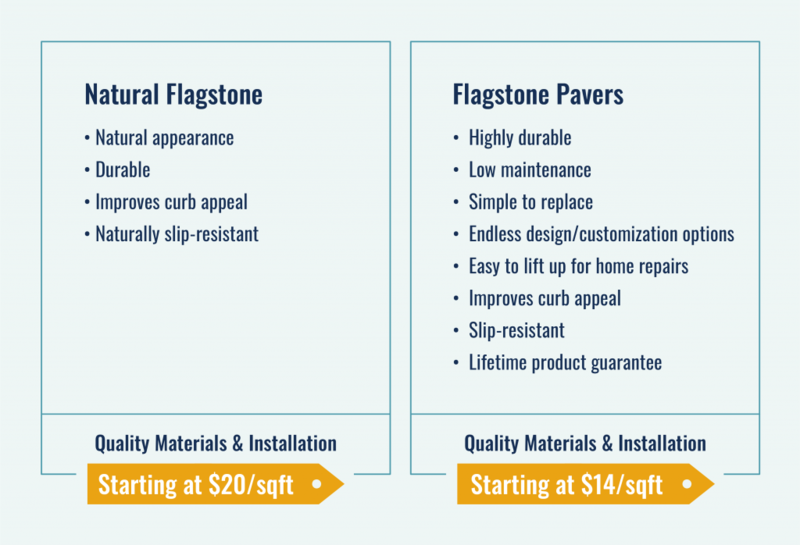 If you are looking for a less expensive option that is backed by a lifetime product guarantee, and is relatively maintenance free, then flagstone pavers are for you. If you are interested in flagstone paver installation and are located in San Diego, CA or Orange County, CA, we can help! 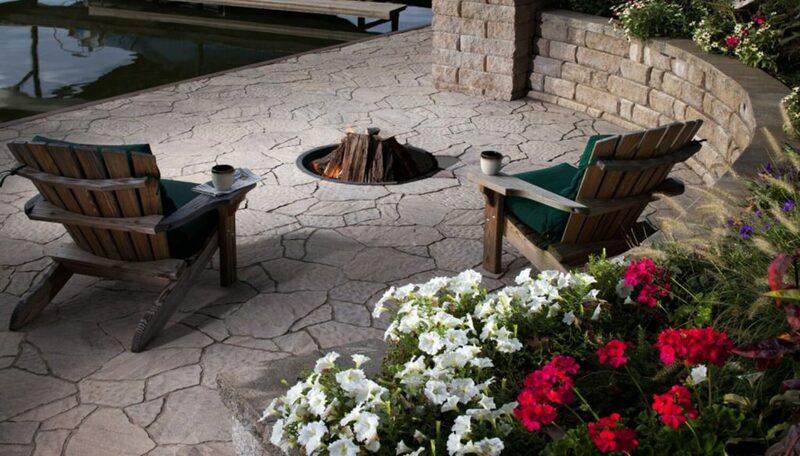 Get a free estimate on flagstone pavers by giving us a call or by filling out our form!